Cities on Speed, GLOBAL VISIONS FOR an urban FUTURE is a documentary project commissioned by The Danish Film Institute and the national broadcaster DR . 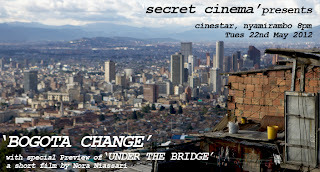 The project is a series of four films – Bogotà Change, Mumbai Disconnected, Cairo Garbage, Shanghai Space-, selected through a call for submissions, directed by four different filmmakers who tell character-based stories on four of the world’s largest megacities: Bogotá, Cairo, Mumbai and Shanghai. We started with Cairo, looking at the disparties between the cities waste management plan and its increasing population. We then moved onto Mumbai ,focusing on the cities choked transport network and the various actors which moved along with, inbetween and at the edges of the stifling flow of traffic, and finally to Shanghai and its inability to find space for its inhabitants, with ideas for a subterreanean city. 'BOGOTA CHANGE' will be the last of this series. This will be shown on 22nd May at 8pm , at CINESTAR cinema in Nyamirambo. (Running time is 58 minutes). TOTAL - 1h 40 minutes. 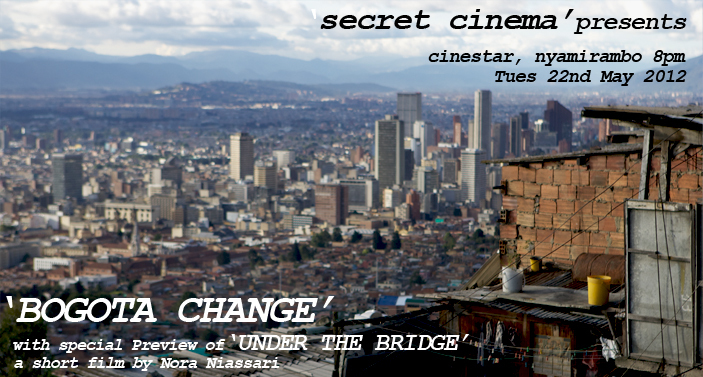 These films are in conjunction with KIST Urban Design Studio Year 4 and there will be a short introduction by tutor Killian Doherty. The future intention is that this film series relating to architecture and urban design will be screened to the public at KIST. Entry is 1500 RWF per person to subsidise free entry for the KIST Students. Your support is enabling these students exposure to resources not readily available at KIST and we thank you for your patronage.